Covering the snack food industry is such fun! Snack Girl so enjoys reading the latest stories on what wonderful, healthy snacks that arrive on the market. When I saw Lazy Cakes on NPR, I just KNEW I had to write about them. Who came up with this amazingly fresh idea? Yes, they took herbs and mixed them into a brownie. And you can buy them at your local convenience store for $4 each. Brilliant! And (surprisingly) legal, because they used herbs called Valerian Root, Rose Hips, and Melatonin - which are herbal sleep aids. Which prompted me to ask the question, why? Why is it legal to put melatonin in a brownie? There's been at least one report of a toddler in Tennessee eating a Lazy Cake and ending up in the hospital. National poison center data show melatonin prompts more calls than any other herb or supplement. What do you think is going to happen if a toddler eats a couple of these? How many children going to the hospital does it take before we can get crap like this off the market? And, why, do you need an herbal brownie for relaxation? Have you tried a brownie without any supplements imbedded? I have met maybe three people in my entire life who didn't self-medicate with food. How many of you grab a cookie when you are stressed? Believe ME, you don't need the herbs. Why do we look to food for more than just sustenance? It seems our convenience store is just packed with uppers and downers with flashy packaging. It reminds me of Alice in Wonderland - drink one and you get bigger - drink another and you get smaller. I think we would be A LOT better off just using FOOD to fuel our minds and bodies for the things we want to do. Now, I bet you are wondering if I tried the Lazy Cake. And, yes, for the purpose of review, I did try it (the things I do for this website, sheesh!). I ate the recommended dosage (1/2 Lazy Cake) at 8 PM and immediately felt dizzy and a tightness in my chest. I'm ALREADY lazy so I didn't think it could make me any lazier. It did make me feel disoriented, and not in a good way. Don't do this experiment on yourself. My advice, stick to real brownies for relaxation. 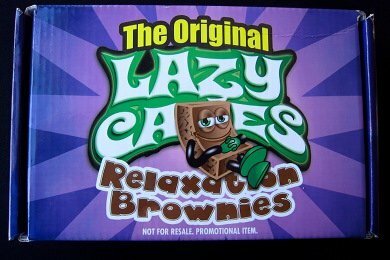 Please share your thoughts on Lazy Cakes. Thanks for pointing out this scary story. It makes me sad that our country has lowered our food standards for this crazy food items like these. Just another example of the lack of regulation from the FDA. If it is classified as a food it doesn't have to meet the same regulations as drugs. And people want less government control over things - we actually need more in this area! Look at the issues with the government regulations about ground meat - and you would think that would be a no brainer! That is incredibly scary. Taking the term sugar coma and making it all too literal. I hope this gets pulled from the market, and quickly! So I get that these are dangerous if they make your chest feel tight and they sent a kid to the hospital, but .. is it the melatonin or the temperature at which it's baked? I take melatonin at night to help me sleep and I'm okay with no issues.. so I'm wondering- what gives with the brownie? I think this is an interesting product and should be allowed, parents should be responsible for what toddlers consume, not the government!! Really like your website, keep up the interesting news.. I CANNOT believe this is legal... it looks like a willy wonka type thing! what kid is not gonna wanna woof one down, and then another, i understand parents need to control what their kid's eat, but u can't be with them 100% of the time! we used to walk or ride our bikes to the candy store, i never would have read the label and known there were drugs in this, to a kid, it just looks good to eat. What are these "scary" ingredients; rose hips, valarian, melatonin. These are herbs, not drugs! Hmm, just my opinion, but I think there is far more noxious ingredients kids are gorging on/being prescribed. It seems to me people are sensationalizing this product and its ingredients. The one in particular that has everyone up in arms is melatonin, of which there is less than 8 mg in the entire brownie. Melatonin has been studied in numerous high dosage studies and has proven to be non-harmful even at daily doses up to 75 mg (That is roughly 9.5 lazy cakes). For those of you who know about toxicology there is no LD50 for melatonin, the FDA couldn't kill lab rats with it regardless of dose! Melatonin has been shown to help kids with adhd, autism, and other behavioral issues; so maybe this would be a good treat for high strung kids. Foodstuffs have been used in combination with mind altering substances since the dawn of man, so thinking this is some new trend is a little shortsighted. Hi. I've used melatonin to help me sleep. It's very effective--it also says on the bottle that it's NOT FOR THOSE UNDER 18. This is indeed a scary way kids can overdose. One of my friends, back in the day when "FIBAR" was popular in the 80s (I guess the current version would be a Fiber One or Gnu bar with fiber in it), had her little sisters find her stash and they were 6 and 7 and spent a LOT of time in the bathroom. Fortunately, it was only fiber and the results were unpleasant but harmless. But kids can and do get into brownies or cookies--no need to put any supplements in them. Thanks for the great post. It amazes me that more people are not outraged by this kind of thing. I think one of the reasons is that we are all so bombarded with information of all types, that many people don't have the time or interest that it takes to research and understand that just because a food product is (currently) legal, it doesn't mean that it's safe. And melatonin isn't exactly evil. It's used by many people trying to sleep without taking harsher drugs that have sleep-walking side effects. Since the dosage here is roughly one tablet's worth of melatonin (in many cases, it's less), I would assume this product, like so many herbal-infused ones, is really guilty of being overpriced rather than anything truly sinister. Phil, I appreciate your level headed remarks. The hysteria that Americans have over anything that has the slightest possibilty of danger to "the children" is massively overblown. There is no way to completely eliminate dangers from life. One toddler? How many toddlers are in the United States? How long has this product been on the market? With that said, I wouldn't go so far as to say they are "just herbs." Herbs have the power to alter chemistry and should be regulated. Perscription drugs, cigarettes, alcohol, and food are all regulated. Anytime you ingest something, it has the potential to affect you. Another observation - the school systems will have to start banning brownies. Just ridiculous! Great advice and excellent post, Lisa. What a stupid idea for a snack! Wow....next thing you know they'll be selling pot brownies to get rid of headaches. I eat 1-2 a day to help with my sleep. The big concern though is what if kids take LSD or worse and eat these.